"Realistic tennis game that lets you edit your own character"
The public is absolutely quiet. Your opponent is at the other side, bouncing the ball. In just a few seconds, you will have to react to a fast and powerful service. Think about how exactly you would do it in real life, and that's how you will be able to do it in Full Ace Tennis. Realism reaches amazing levels, with many details that will make you feel a close experience to what real tennis is. Game play is accurate, and requires your technique in order to do well. Besides, its graphics are stunning. If you want to make it even more real, you can create your own character with the character editor. 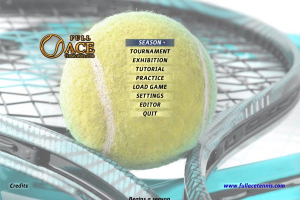 Full Ace Tennis has a lot of details that make it a very complete and realistic game, like the ball trajectory, the effects, and the bouncing. The surface will also affect on the game. Your abilities will decide how you should play, but you are the one that takes decisions. Good positioning and calculating times are key points. It is recommended to play with a pad. And if you want to have a blast, try the online mode and challenge other real players.